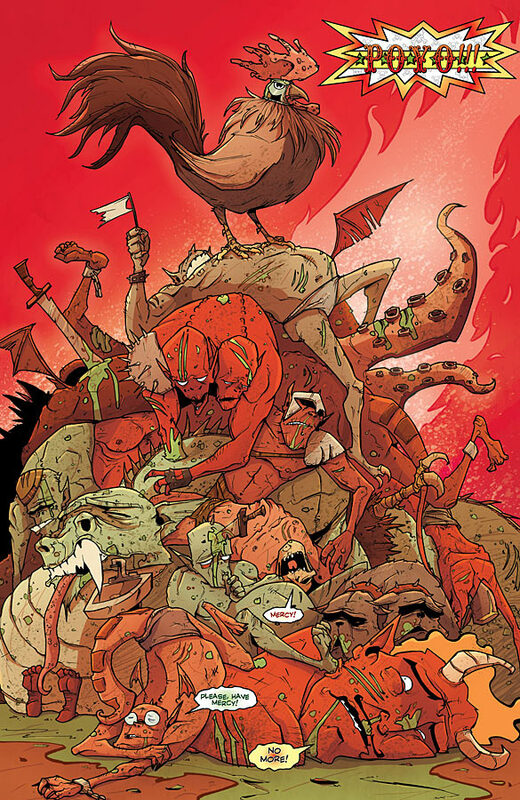 Matt C: Chew has been a mainstay on my pull-list since it launched three years ago. Its bonkers concept, coupled with the insane relish in which John Layman and Rob Guillroy launch their creations at the page, ensures that it's an absolute blast to read month in, month out. 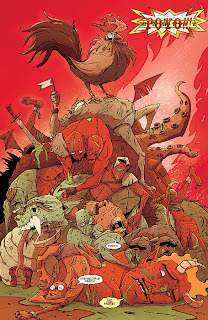 With a TV show in development and a burgeoning army of fans, along with the seemingly endless stream of ideas that the writer and artist appear to conjure up with apparent ease, it looks like Chew will be around for some time to come, and if you haven't checked it out yet, there's still plenty of time to catch up. 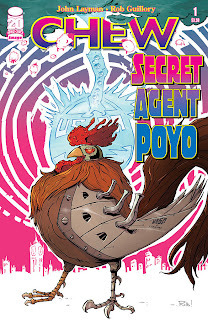 Which brings me onto this special one-shot featuring a fan-favourite character, Poyo, who first appeared in Chew #8. While this release may have initially looked like a bit of throwaway fun, it actually turns out to crystallise everything that's brilliant about Chew in one exceptionally entertaining package. There have been a lot of high points throughout the series up to now, but Secret Agent Poyo may just be the best yet. Containing more laughs per page than any other comic I've read in the past few years, this is so utterly relentless in its off-the-wall hilarity that it almost seems like Layman and Guillory had a mutual bet on to push the concept of a government-employed killer rooster as far out as they possibly could. The script is jam-packed with infectious silliness as Poyo gets involved in attempting to thwart a plot to cover the British Isles in a deluge of farm animals (! ), and the genius of what Layman does here (as he does so often in the regular series) is that he takes some of the most madcap, idiotic ideas ever seen in comics and makes them inexplicably compulsive and supremely funny. And, in case you're wondering, it's way too smart to be dismissed as simply dumb fun. Then there's Guillory's artwork, bubbling over with a delirious, occasionally lysergic energy that matches the plotlines, and full of incidental detail that adds so much to experience. A memorable example here is a picture of Michael Bay next to one of Osama Bin Laden adorning the walls of Satan's cave - yes, we even find the time to visit Hell during the course of the issue!